Vegetarian tacos often mean substituting ground beef, or chicken, for loads of highly processed vegetarian “meat” items which can also be very expensive. Other alternatives for vegetarians might include heaping scoops of beans or rice which are also not part of the ketogenic way of life. My solution? An old school vegetarian meat substitute that can be seasoned to impersonate multiple different recipes: walnut meat! It may sound strange at first, but raw walnuts have a unique texture that makes them perfect for this. You can also blend this with other vegetables and seasonings to create a variety of other dishes. 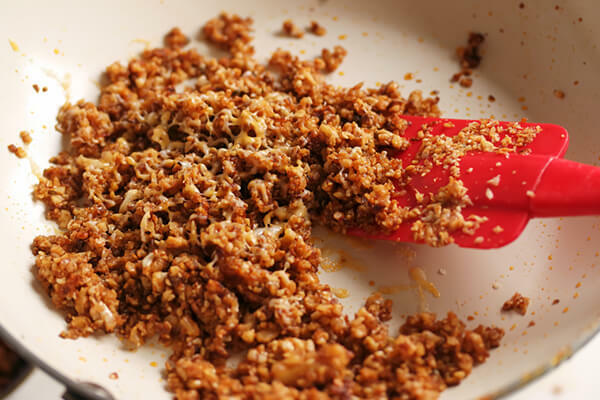 Years ago, I used to make this mixture with walnuts and sundried tomatoes. 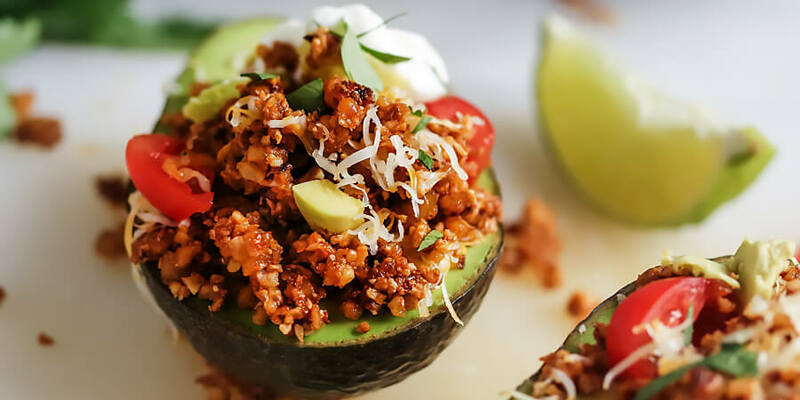 To make this keto friendly, we are blending walnuts with cauliflower and hulled hemp seeds for a spicy and flavorful taco filling that we can serve in avocado boats. 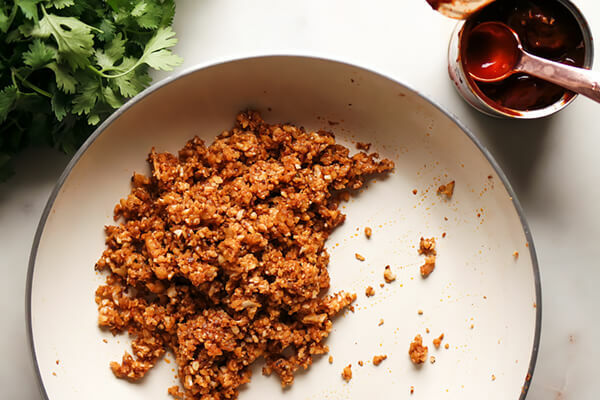 You may not be fooled into thinking this is real ground beef, but I can guarantee that the flavor will have you wanting to whip this mixture up weekly! This process is quick and makes multiple servings so it’s perfect for meal prepping or as a quick addition to a salad or keto taco shell. After pulsing the taco “meat” ingredients, the filling is lightly fried in two batches in a hot skillet. This makes it easy to taste and adjust the seasonings to your specific level of saltiness and most importantly, spiciness. By using adobo sauce from canned chipotle chilis, you get a nice amount of heat along with the beautiful red color. If you are daring, you can even add half of a pepper to the food processor but be warned, it’s very spicy! You would also want to adjust the carbohydrates when tracking if any whole peppers are used. These can be a great option for a light keto lunch. 1. 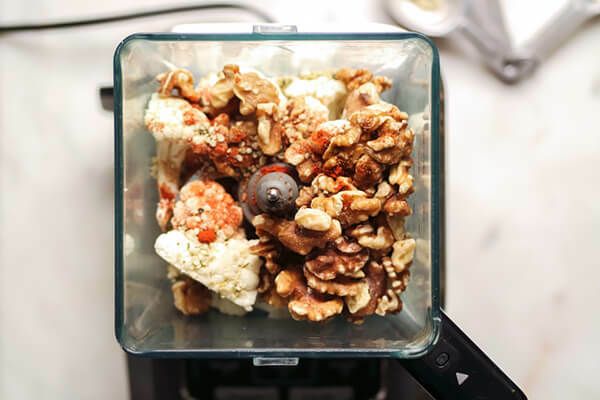 Break the cauliflower into florets and place in a food processor with the raw walnuts, hemp seeds, and seasonings. 2. Pulse the mixture a few times until the cauliflower and nuts become a crumble. 3. Working in two batches, heat half of the oil in a large non-stick skillet over medium heat and add half of the taco meat mixture. Stir well as the nuts are toasted and the cauliflower softens. 4. Add half of the adobo sauce and fold it into the mixture, making sure the mix is browning evenly on both sides. Remove from heat and fold in the shredded cheese, season with salt, and add to a serving bowl. Repeat with the rest of the taco filling. 5. Slice the avocado in half and remove the stone. Scoop part of the avocado out with a spoon to make room for the taco mixture. Save and add as a topping later. 6. Fill with ½ cup prepared taco mixture and top with sour cream, shredded cheddar cheese, or any of your favorite low carb taco toppings! 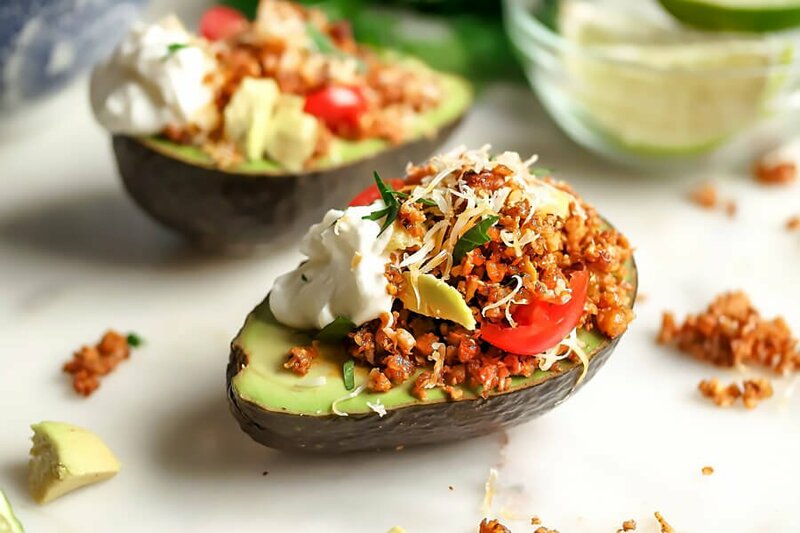 This makes a total of 1-servings of Vegetarian Taco Stuffed Avocado. Each serving comes out to be 392.17 Calories, 46.49g Fat, 6.3g Net Carbs, and 13.23g Protein. 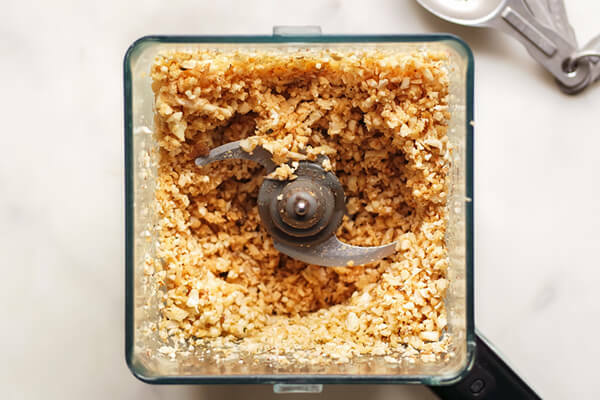 Break the cauliflower into florets and place in a food processor with the raw walnuts, hemp seeds, and seasonings. Pulse the mixture a few times until the cauliflower and nuts become a crumble. Working in two batches, heat half of the oil in a large non-stick skillet over medium heat and add half of the taco meat mixture. Stir well as the nuts are toasted and the cauliflower softens. Add half of the adobo sauce and fold it into the mixture, making sure the mix is browning evenly on both sides. Remove from heat and fold in the shredded cheese, season with salt, and add to a serving bowl. Repeat with the rest of the taco filling. 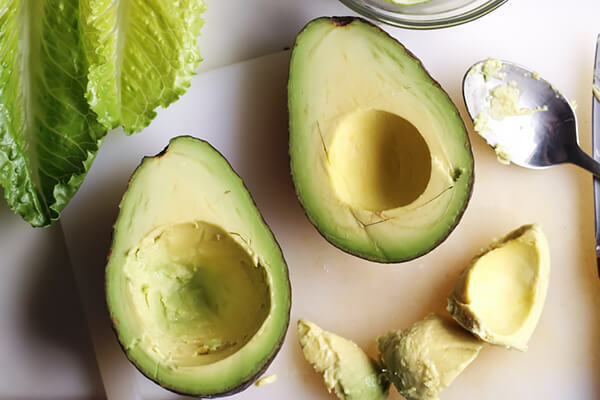 Slice the avocado in half and remove the stone. Scoop part of the avocado out with a spoon to make room for the taco mixture. Save and add as a topping later. 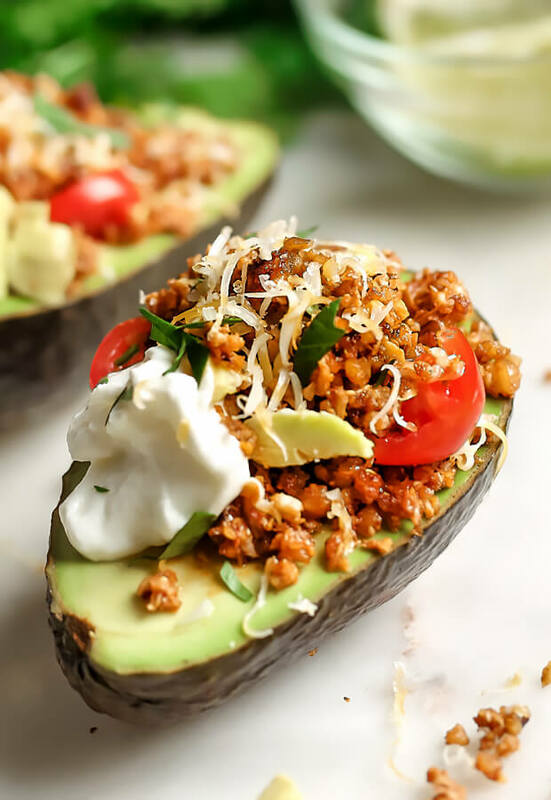 Fill with ½ cup prepared taco mixture and top with sour cream, shredded cheddar cheese, or any of your favorite low carb taco toppings!